If you’re looking for a landscape in Kalamazoo that has it all…keep on reading. 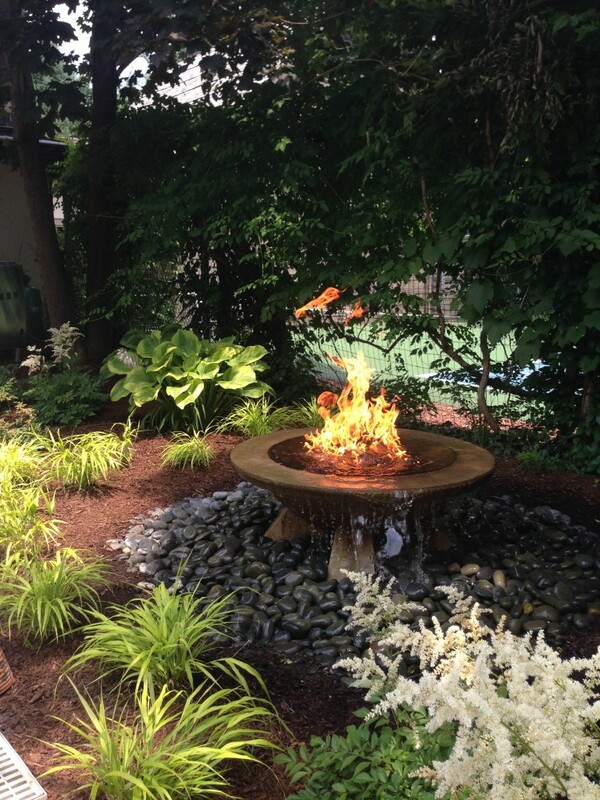 This landscape and water feature project in Kalamazoo Michigan has sooo much going on in it, that we will be your personal tour guide. This homeowner really just wanted a ‘face lift’ for the landscape. There was already a fountain on the property, but the homeowner wanted more water features…and wanted something that no one else had. Plants were installed all around the foundation of the home. Many of the plants we chose bloom at different times through the year, and also included evergreens, which all together create seasonal interest year round for these Kalamazoo homeowners. While the lot is quite spacious, there was still a desire for privacy and additional screening. We used hardy evergreens and a few red twig dogwoods to create the desired screening, these plants create seasonal interest as well. We revamped the courtyard by creating a more functional space. The original courtyard was outlined by brick, and had a few natural stone steps. 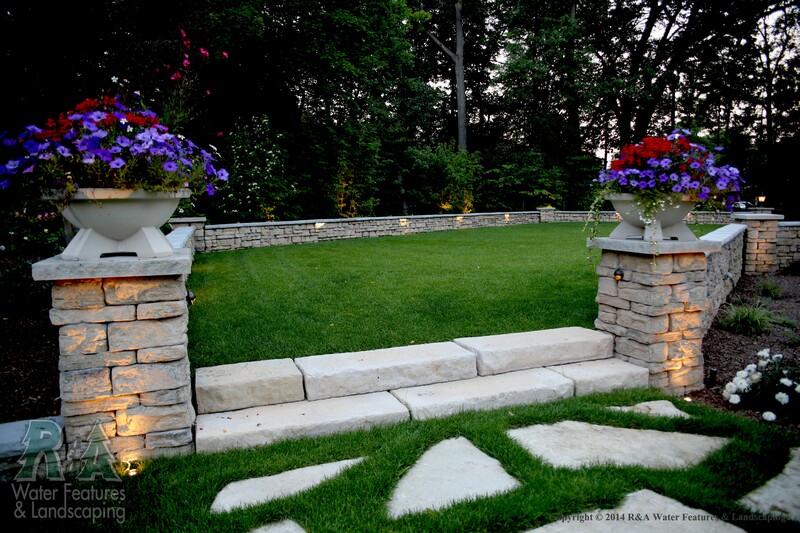 To define the space, we replaced the brick with a taller seat wall, replaced the steps with larger natural stone steps, while also widening the area. When guests visit the courtyard, they will also find a newly installed informal flagstone landing area. Walking by this Kalamazoo home, passerby’s will notice the custom built seat wall, which creates a welcoming atmosphere, yet still helps establish boundaries. Three large drilled moss rocks greet guests at the front of the driveway. We took 3 large moss rocks and drilled a hole through the center so water could spill over the top. This water feature works like a pondless water feature, where it allows water to spill over the top, and flow down the sides, ending up filtering through the gravel, then recirculated back through the rock. Fire and water don’t go together you say? Well…you may want to reconsider. This Kalamazoo homeowner wanted something that no one else had. This was a bit of a challenge, but in the end we provided the homeowner with something very unique, that no one else in the area had. Check out additional projects we have completed for inspiration for your next project. Or if you’re ready, contacts us today to get started!